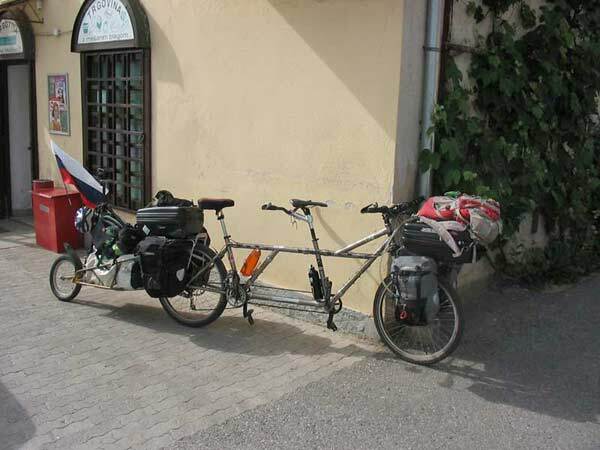 Days of learning, pedaling and gathering experience. One very hot, late-spring day, far away from the daily routine and stress, begins my day of learning, listening and gathering experience. Conditions where extreme, regarding temperatures, for a guy who spends most of his days in front of a computer screen, and also daydreaming a lot. I could be a quiet grandfather. But, no way! I’m going to follow my Dream Come True Times. And is that what I really want? Stop! Let me check it out right now. 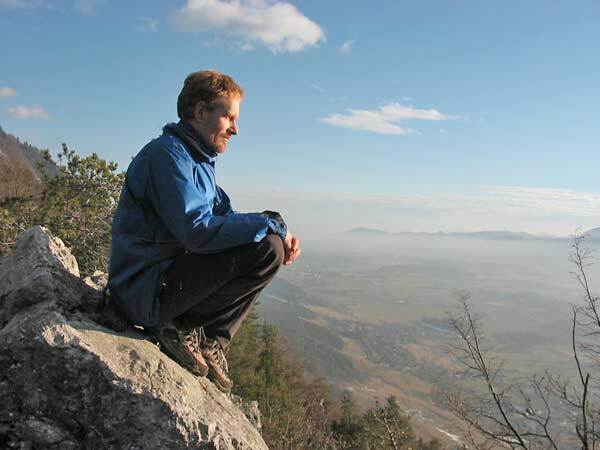 Am I going away from my comfort zone? Plain trimmed real life, from moment to moment, changing with all the smells , sounds and other influences, and gadgets. Usually Jamie invites a co-driver. 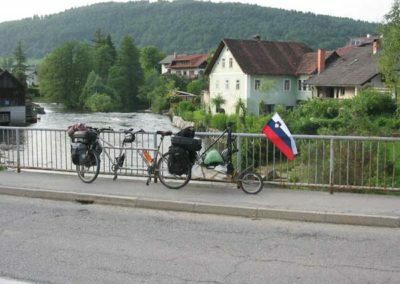 In Slovenia, I even invited myself or should I better say that the fate connected us together and I rode with him an unforgettable cycle day from Kranj, (80 km) to the source of the river Krka in central part of Slovenia. 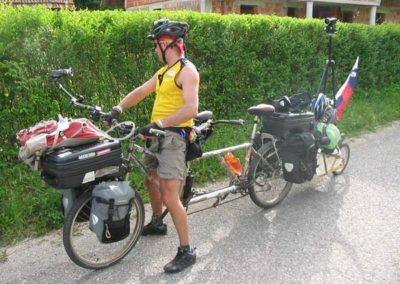 His tandem bike with all the equipment weighs almost as a motorcycle. 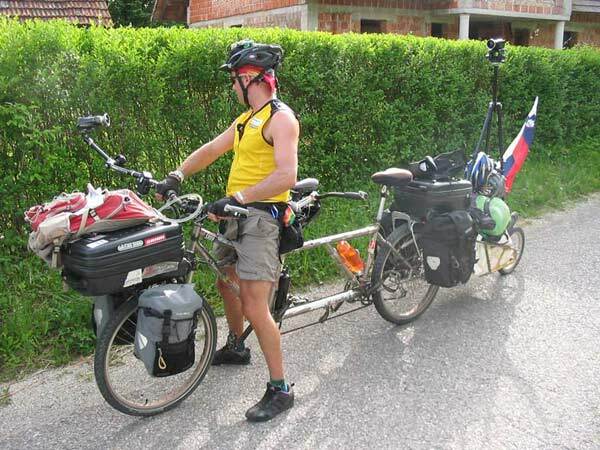 Jamie is not the usual lightweight traveler, but he carries the all the recording equipment of his sponsor Panasonic. 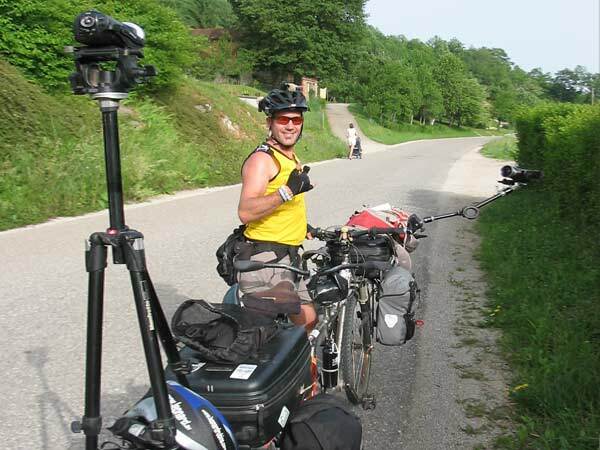 He records the life and events on the road. 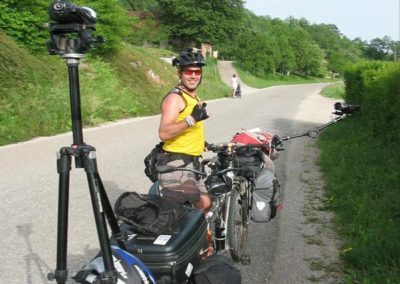 Working with top producers such as Survivorman “Les Stroud who is working for Discovery Channel … Jamie will stay a few months in Europe, and he came from Africa. To get major sponsors attention, he had to experience and learn a lot and show some results. 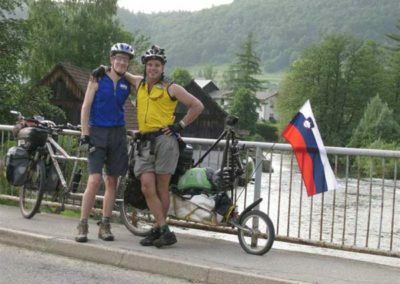 I was a part of Slovenian story in which Peace Pedalling became part of mine. 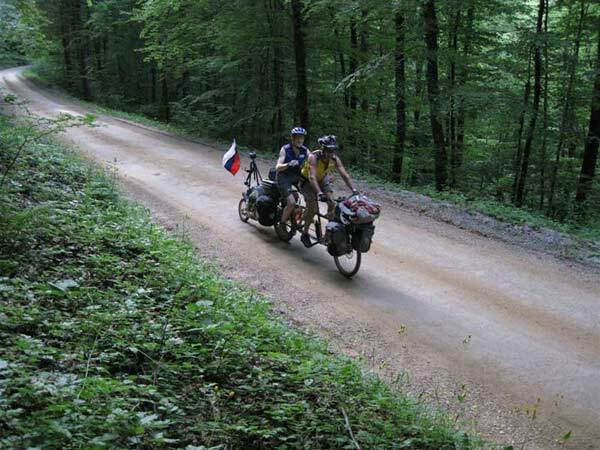 The roads on which we were pedalling together, was a time of sobering transformation for me! 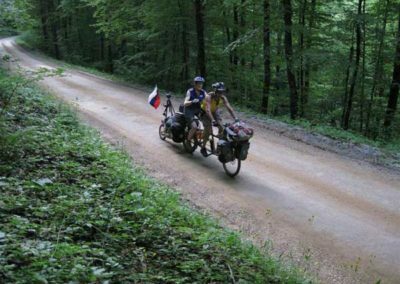 The time finally came to hit the road and my first rider was Leonard who I met only a moment at a bike race on my first day in Slovenia. Leonard shared with me that day, that he had been dreaming and even preparing for of a worldwide bicycle trip, for several years. So it was not very tough to convince him that we were mean to adventure together on the tandem. Leonard met me in Kranj with the unique mix of excitement and fear of a little boy waiting in line for a scary roller coaster ride; our ride together was not far from one, especially emotionally for my boy Leonard. We had a scorching hot day for European standards with heats pumping at 33 degrees (95F) as we got a late start. 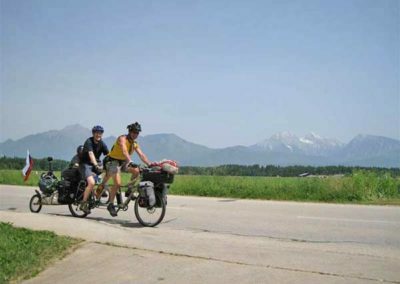 But we were rolling along in no time with an endless stream of conversation going all the way to the capital of Ljubljana. Leonard had only planned to join me for a few hours, but after a nice picnic lunch on a bench in the capital he was not going home in a hurry. He stayed on as we made our way towards Dolenjska region. 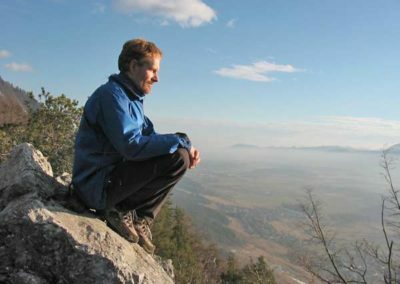 But what I did not know was the chaos going on in Leonard’s head as we pedaled further and further away from his “comfort zone” of family, work and wife. About 10km outside the city he was ready to call it quits—not from the heat, but from the fears that were coming up in him that he was very open to share with me. I talked him into moving on an we had deep talks about his dreams, what was holding him back, and it was some of the most intense tandem cycling conversations I’ve ever had. 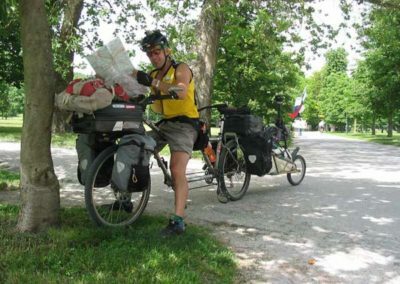 But as we talked, and rolled an interview on the bike, and moved further away from the capital, he loosed up just a bit more. 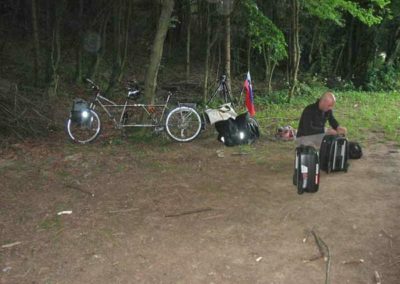 We finally made it to the town of Ivancna Gorica, where he was planning to take a bus back home to his “nest”. But as we were waiting for his bus to come we shared a beer and talked about the day. 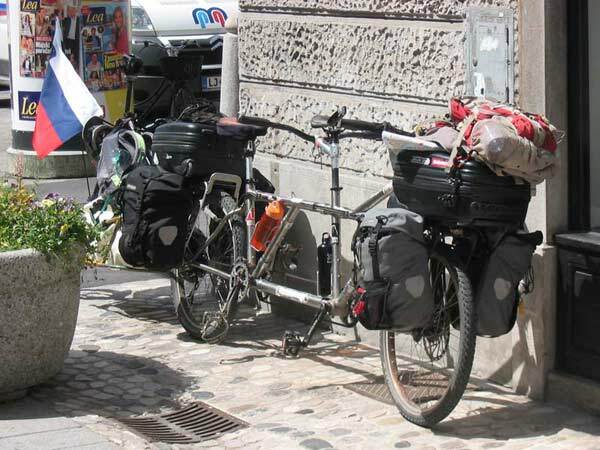 I knew he did not REALLY want to go home, but as Leonard heard me lining up a free camping spot at the local school and going about the business of international bike touring, he knew he had to stay with his “mentor”. It probably helped that some local guy joined our table who was celebrating his birthday and bought him his 2nd beer, which loosened him up just enough to order some pizzas, have some laughs and eventually make our way to the local high school where we were told of some epic free camping for the night. The world tour tour is complete, the book is released and Family Book Tour is finally over after 7 months and 38 states of family advenures and 84 presentations. Phew! We’re now kicking off our next big social venture called LuDela with a grand vision to illuminate the minds of children in need around the world with millions of books while brining safer, more enjoyable candlelight to the developed world.